Goodbye, Magnolia was written by Krista Noorman. It is the first book in her Cornerstone series. I was given a copy in exchange for my honest book review. All opinions are my own. I don't always like book trailers... but this one? This one is perfect. First of all... the title is just perfect. Goodbye, Magnolia just works on so many levels. I refuse to tell you why I think that though. I totally get Maggie. I just immediately felt connected with her. She reminded me of myself in a lot of ways. Really over thinking some things. Not seeing some other things that might be obvious to other people. Getting really focused on one aspect in her life and kind of neglecting other parts. I get her. And so I TOTALLY understood all of her feelings towards Simon. Hating him, liking him, lusting after him, still not being able to give up the reasons for hating him. The development of everything with them from the first page to the last was fabulous to me. It was real. It wasn't a pretty little romance. There was good and bad. Their was heat and there were arguments. Real. And Simon. Simon is the perfect guy that you love to hate but REALLY want him to be the good guy. You want him to be THE guy. For every bit of confusing guy... he was totally the open book. The back and forth was the frustration that I feel happen in real relationships. Loved it. I am so excited to see the second book in the Cornerstone series, Until Then. Can't wait to see where Krista Noorman takes the series. 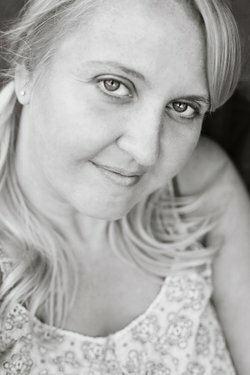 Krista Noorman is the author of the young adult novel, The Truth About Drew, and the contemporary romance, Goodbye, Magnolia. Most of her life has been spent scribbling away in journals, honing her writing skills, while documenting her every day life. But it wasn't until she took part in National Novel Writing Month that she found her true calling and turned her pen (or rather her computer keyboard) to fiction.